On June 21 during the NHL Awards ceremony at T-Mobile Arena in Las Vegas, the Vegas Golden Knights selected their roster, the last step in establishing themselves as the league’s 31st franchise. 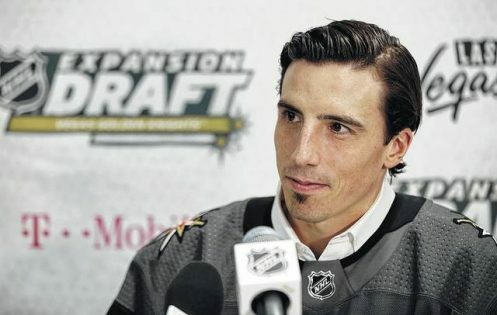 It had been rumored that perhaps the most lucrative player available was pegged since February to be chosen: Marc-Andre Fleury. Fleury has spent his entire 14-year career with the Pittsburgh Penguins, leading them to the Stanley Cup in 2009 and helping them to back-to-back cups in 2016 and 2017. However, with rookie Matt Murray stepping in last season and carrying the Pens to the Cup without Fleury, and finishing off the Conference Final and Cup Final this year, Fleury’s time in Pittsburgh was all but over. So, what does a 3-time Stanley Cup Champion winning goalie with over 400 wins in his career provide to the expansion Golden Knights? Fleury finished last season with 34 games played, going 18-10-7, with a 3.02 GAA and a .909 SV%. Those are Fleury’s worst numbers since the 2005-06 season, in which the Pens were basement-dwellers in the league. However, in the 2017 playoffs, had it not been for Fleury the Penguins very likely could not have advanced past the first round. Fleury played in 15 games going 9-6, with a 2.56 GAA and an outstanding .924 SV%. If you watched any of the Penguins’ playoff games, it seemed as if he was bailing them out every single night, especially in the first period. Fleury is an extremely capable and proven goaltender with at least 3 years left in his prime. Look for him to bring a stabilizing presence to the crease at T-Mobile Arena. With a Top-4 defense core likely consisting of Nate Schmidt, Shea Theodore, Colin Miller and Jason Garrison, barring any more trading away of D-men, Fleury would be in good company on his side of the ice. But without one of the most potent offenses in the league including the likes of Sidney Crosby, Evgeni Malkin and Phil Kessel, Fleury might be short on goal support. James Neal, Vadim Shipachyov and Jonathan Marchessault are a likely first line for Vegas, and after that the drop off in scoring punch is huge. General Manager George McPhee has made it clear that he is building for the future, which has become evident in his trading away players for picks. With every trade made, the Golden Knights look less and less competitive for this upcoming season. One can only wait and see how the on-ice product performs when the time comes. With a solid blue line, Marc-Andre Fleury is poised to be given every opportunity to have his starting position again. He is most definitely capable of having a good year, and it is not out of the question that he could win 25+ games. Regardless of how the Golden Knights fare in the standings, look for Fleury to prove once again that he can carry a team on his back.